The last 90 continuous day performance period to report on MIPS, October 2, 2017, is just around the corner. If you haven’t already started with preparation for MIPS, the 2016 Quality and Resource Use Reports (QRUR), which were released yesterday, can serve as a good starting point. 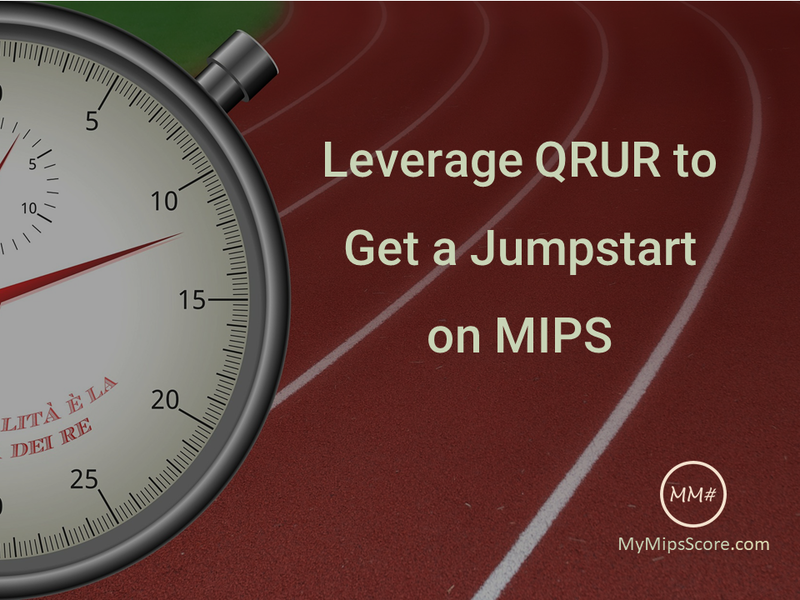 Let’s take a look at how you can leverage the 2016 QRURs to jump-start your MIPS readiness. Reveal Comparative Performance: Your QRUR can give you a good sense of how your organization (TIN) is doing as compared to other TINs on the measures compared. You can also compare your performance in 2016 to that of 2015 and see if you made improvements on the areas your organization focused and worked on. Determine Baseline Performance: The performance percentages of the quality measures included in the QRUR can serve as a baseline and give you a rough estimate of how you would fare in MIPS on those measures. Identify Quality Measures: As the quality measures included in the QRUR also used the minimum case volume of 20, you can use some of the same quality measures (the ones in which you excel) for 2017 MIPS reporting. Identify Improvement Activities: Utilize the report by diagnosis to identify the care gaps and determine the gaps that you are currently working on or plan to work on. Look for MIPS improvement activities related to those areas. Reporting on these improvement activities will help you get credit for the effort you are already putting in. Get a Heads-up on Cost: Cost is risk adjusted based on the mix of beneficiaries attributed to your TIN. Paying attention to cost and understanding where you stand as compared to others in terms of quality of care delivered and the cost at which it was delivered will have you better prepared when the cost performance category weight jumps directly to 30% in 2019 (up from 0% in 2017 and 10% in 2018). *Update: According to Bipartisan Budget Act of 2018 (HR 1892) released on Feb 9, 2018, MIPS transition years are extended till 2021 (3 additional years). As a result, weight for the Cost performance category may stay at 10% for a few more years. Incomplete Quality Picture: QRUR includes a subset of the quality measures available under MIPS. The included measures focus on delivery of effective clinical care, caregiver centered experience and outcomes, population health, communication, and care coordination. Although all of QRUR measures are included in MIPS, QRUR doesn’t include many specialty specific measures that might be more relevant for your organization. It might be excluding the measures in which your organization excels. Hence, the QRUR report might not give you the best picture of your practice for the Quality Performance Category. Impact of Submission Method Unaccounted: The benchmark utilized for QRUR would not be the same as the benchmarks for the different submission method options available under MIPS. The points earned for the same measure for the same performance rate can be remarkably different based on the submission method, and hence the payment adjustment. Changes in Performance or Clinicians Not Reflected: 2016 QRUR will not be a true representation of your TIN’s performance in 2017, as it doesn’t account for the work-flow and other improvements as well changes in the clinician composition of your TIN. Utilize 2017 Data: The good news is that you already have more than eight months of data available for 2017. You can get the data from your EHR in QRDA-III or CSV format. Pull your performance data for the measures identified (star performers from QRUR + other relevant measures from a selection of 271 measures), and compare your numbers with different submission methods and submission options (Group or Individual). Evaluate Your Options: We strongly advice evaluating the measures and submission methods before finalizing. MIPS is different than any other incentive program you have participated in. Performance on the measure matters a lot and the performance benchmarks for different submission methods vary markedly.